Like Paul and Suja Phinehas, featured in a recent story on the main Bearing Witness site, Naomi Tamura’s Christian faith makes her a religious minority. At Mennonite World Conference Assembly 16 in Harrisburg, PA, this past July, Tamura shared with us both the struggle and the opportunity that accompanies Christian faith in Japan. Naomi Tamura (third from the right in a pink cardigan) with her church community. Photo provided. Both the Phinehases and Tamura identified particular ways in which their Christian faith can connect with the broader society. 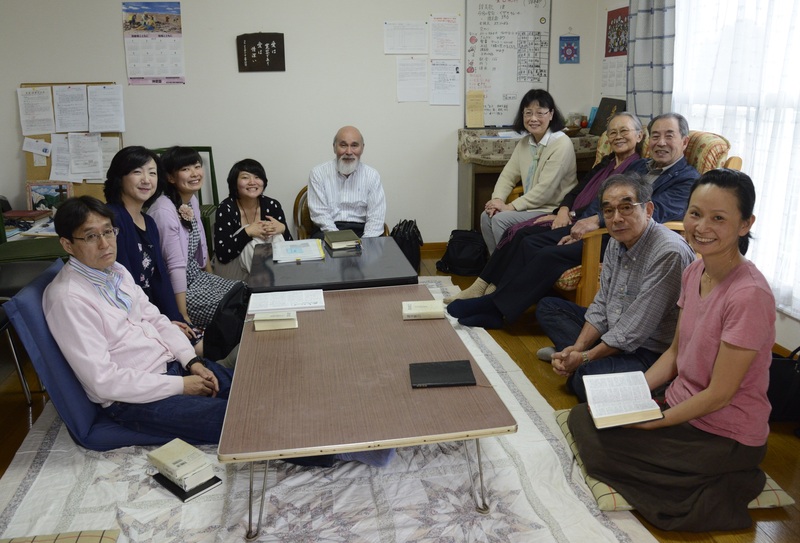 While Paul and Suja focused on prayer as the bridge that connects them to broader Hindu society, Tamura spoke of peacemaking that the bridge that connects her faith to the Japanese context. If you are part of a Christian minority, how do you see your faith connecting to the culture around you? If Christianity is the dominant religion where you live, what aspects of your faith do you think speak most prophetically in your context? Read and listen to Naomi Tamura’s story in her own words here.